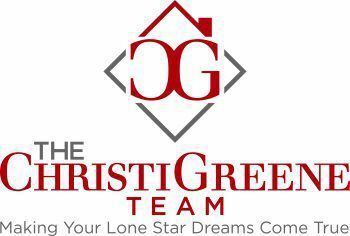 At The Christi Greene Team we strive to consistently provide high quality, innovative and exceptional real estate experiences for buyers and sellers in the DFW Metroplex. We want your experience in Buying or Selling a home with us to be such that you will want to share our Team with others so that they can have as wonderful a Real Estate Journey as you have had. Our Agents specialize in your specific needs -- Buyers or Sellers along with an incredible Director of Client Services to walk you through each step of the process. We love what we do and enjoy helping people each step of the way in buying and selling real estate. As long time residents of DFW, we enjoy spending time with friends and family all over the metroplex and always enjoy seeing past clients/friends when we are out and about. Making Your Lone Star Dreams Come True. I highly recommend Christi's real estate services. She helped us sell our house after we moved out of the country. We were so grateful to have someone watch over the house and make sure everything was in order since we were not there to do it ourselves. She is very hands on and attentive to details. She also has a great knowledge of the market. Instantly view homes, get full property details and more with our app.